By definition a tartine is an open faced sandwich with some sort of delicious spreadable item on it. Technically by that definition a really good pb&j could qualify as a tartine. 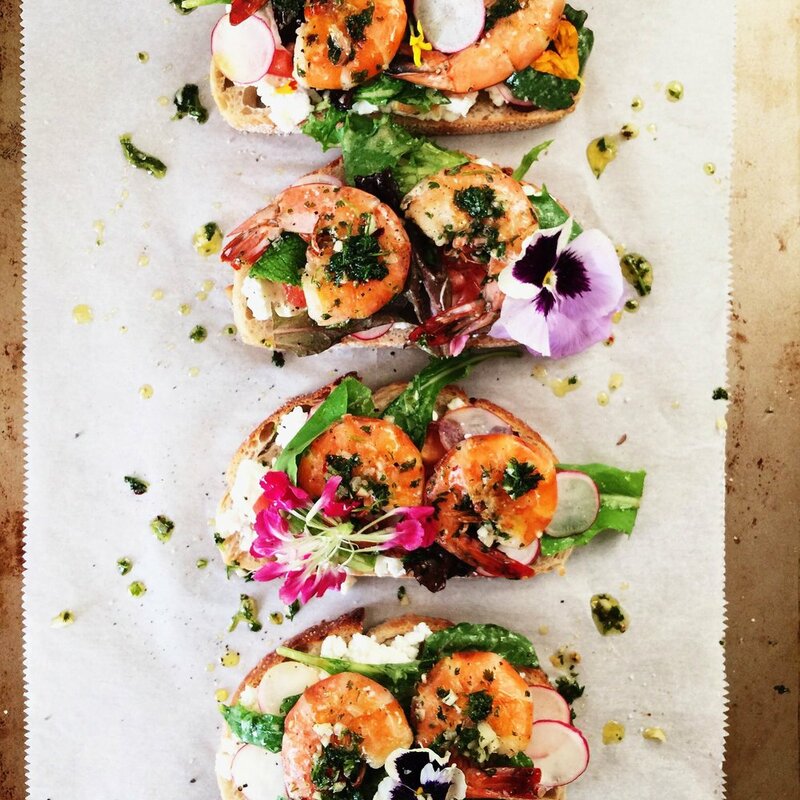 These shrimp tartines are exemplary of what good summer eating is. Fresh ingredients that leave you feeling satisfied, yet light. To answer the age old question of: can you eat the shell of a shrimp? The answer is YES. Now as a boiled shrimp shell is quite unpleasant to consume. When the outside have been pan fried to a crisp, the texture can actually be a nice texture to the dish -not to mention the shrimp are tossed in this fresh herbal garlic sauce. So, if you peeled them after cooling, 1/2 the flavor goes with it. 1. A good artisnal bread will create a strong base for your toast. Sorry but Wonder Bread will not do here. Spread on a good brand of butter and pop them on the grill or pan fry them to golden or even a slight char. 2. You need a creamy spreadable cheese. Ricotta cheese was used here. Burrata would also make a nice spread. 3. Fresh baby greens tossed in a lite vinaigrette. Some grocers sell baby salad mixes with fresh herbs & edible flowers in them, giving your dish plenty of flavor and beautiful color. 4. Other fresh veggies for texture. For these shrimp toasts I added thinly sliced heirloom tomatoes & radishes. One soft & one crunchy. 5. Prepare the sauce for the shrimp by combining finely chopped herbs with garlic, red pepper flakes, olive oil, and a squeeze of lemon juice in a bowl. I used chervil, but Italian flat parsley works as well. 6. Crispy shrimp is the only way you can leave the peel on. Wash your shrimp and pat completely dry. In a screaming hot pan fry them up in some olive oil. Season lightly with some salt & fresh pepper. Once pink and crisp, dump into the bowl of your herb sauce, tossing to coat completely. 7. Assemble your sandwiches or lay out all the ingredients and have everyone build their own.